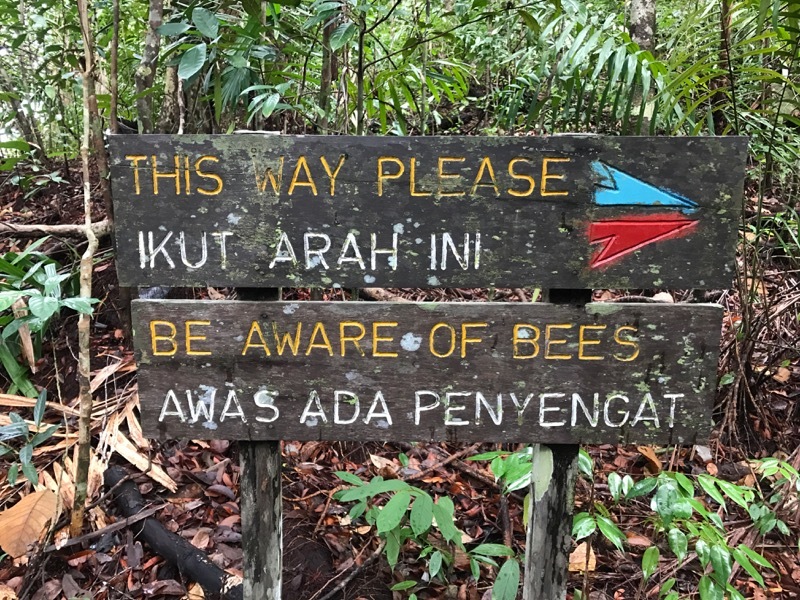 This is the final part of a 7-part account of my trip to Peninsular Malaysia and Borneo in January/February, 2017. Part 5 featured oh-so-many frogs, an orange lizard, and pitcher plants! Part 6 featured blue-eyed lizards and green snakes! As always, please let me know if you have any suggestions or corrections of the IDs. 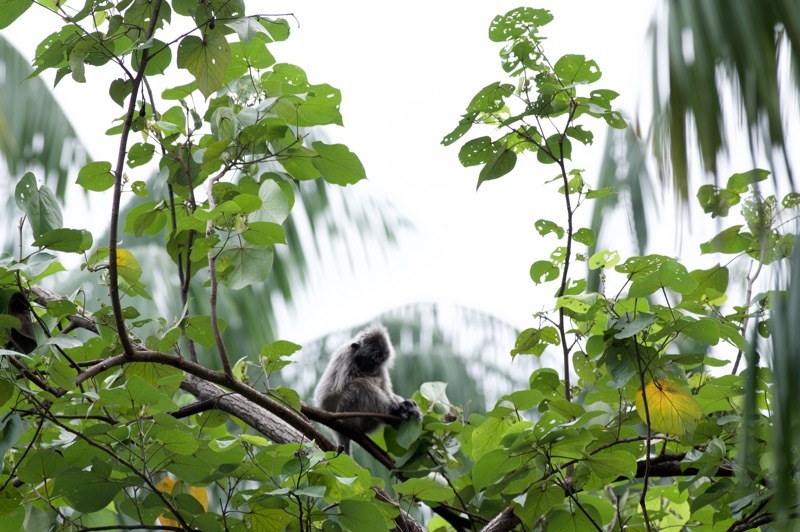 Bako National Park occupies the northern part of a peninsula on the outskirts of Kuching, just a little east of the Santubong Peninsula. 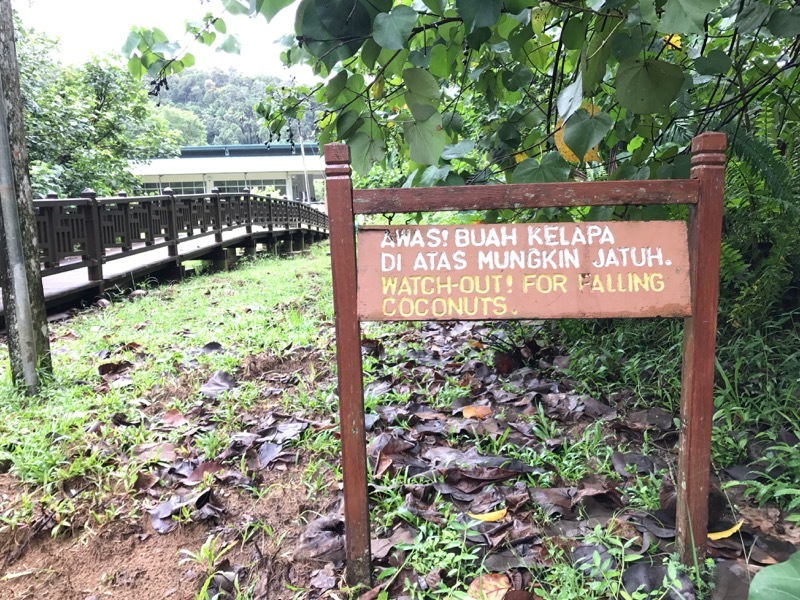 When I first arrived at Kuching, I had an unscheduled day before I was to head to Kubah, so I arranged a day trip out to Bako. Also, on my last day at Santubong, I arranged a second such day trip. 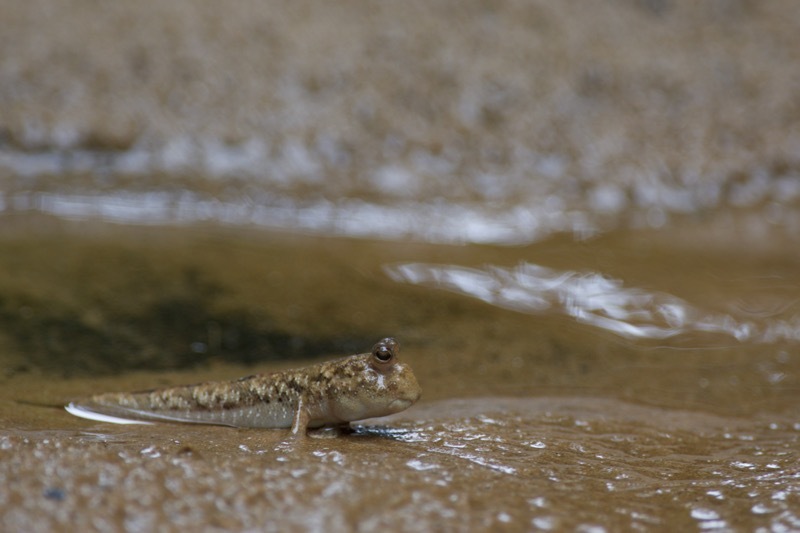 By that time I thought I had seen everything I was going to see by day at Santubong, so it seemed worthwhile to try the different habitats of Bako again, before returning to Santubong for one final round of night herping. Bako is on a roadless portion of its peninsula, so all access is by boat. The tides control when and where you can access or leave the park. For both of my visits, I got a ride to the Bako Jetty, then waited for the tides to rise and a boat to be available. The first time I waited an hour. The second time it was only about 30 minutes. The wait is a little unsettling because they are vague about how long it might take, and then there's some jockeying to get on one of the first available boats. But it wasn't too bad. When I eventually got my ride up the river, the tide had risen enough to allow boats to get near Bako, but not enough to allow them to reach the dock. 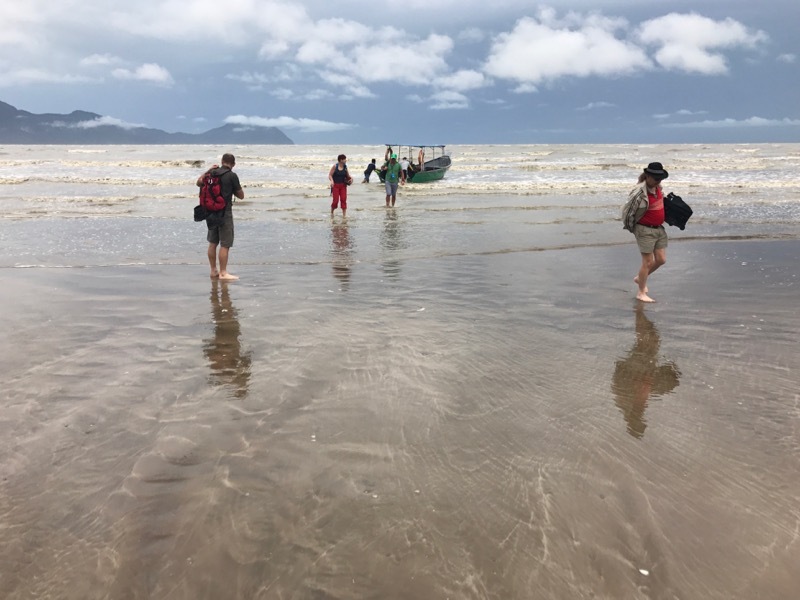 So we took off our shoes and socks, rolled up our pant legs, and walked through the last 50 yards or so of shallow water and mud flats to arrive on the beach. 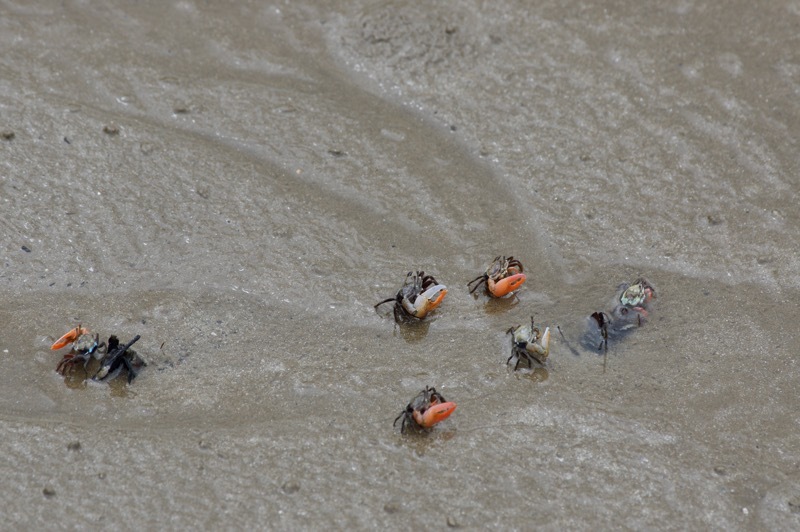 Colorful crabs and nearly terrestrial fish skittered and hopped all over the mud flats. As you approach the headquarters from the beach, helpful signs begin to appear. Perhaps these are the aforementioned wild animals to worry about? 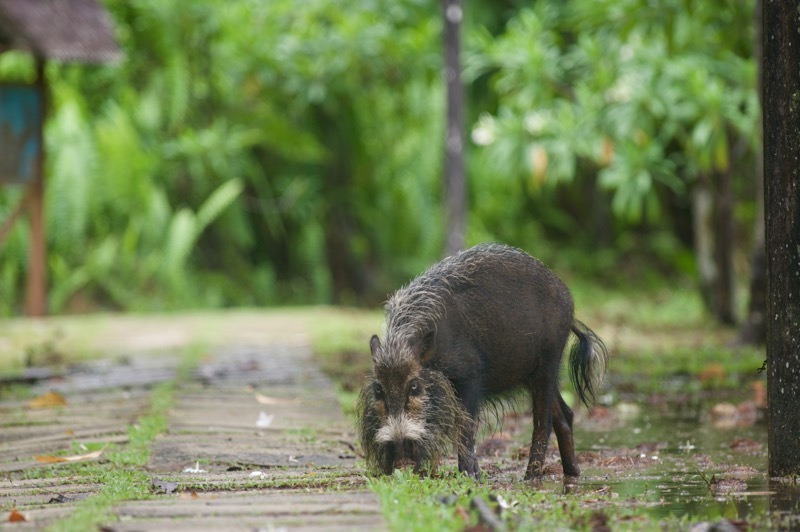 In any case, these pigs were plentiful and unafraid of tourists. More helpful signage. So many dangers! 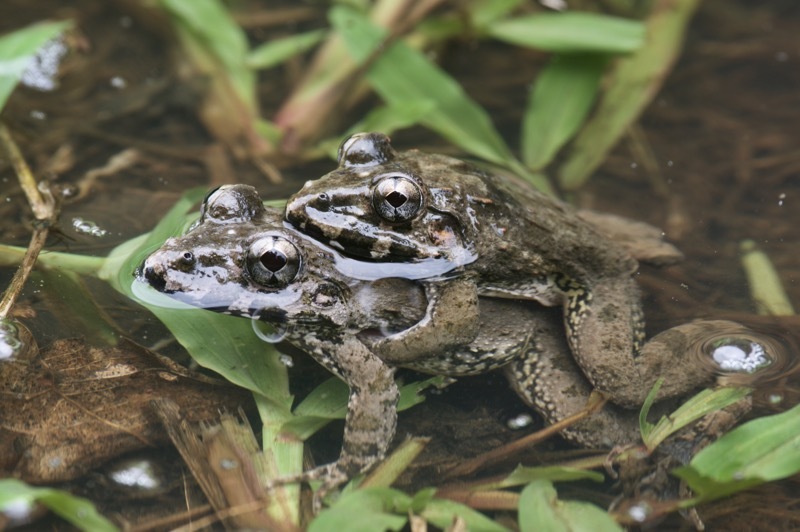 On my first visit, a shallow stream near the headquarters was a cacophony of calling and splashing and breeding frogs. None of the other visitors or guides or park staff paid the slightest attention to them, even when crossing the stream on the boardwalk. I figured the frogs must be there all the time for the guides to not even bother pointing them out to their guests. But when I returned a few days later, they had all disappeared. Lesser Swamp Frog (Limnonectes paramacrodon), I think? 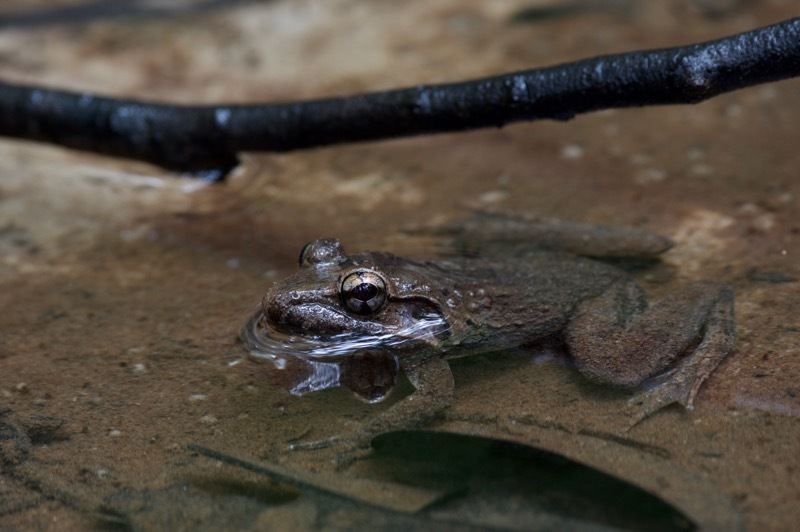 I only saw one other frog at Bako, in a calm shallow stream much deeper into the forest. I think it's a different species, but I have a hard time identifying these Limnonectes frogs. Rough-backed River Frog (Limnonectes ibanorum), I think? 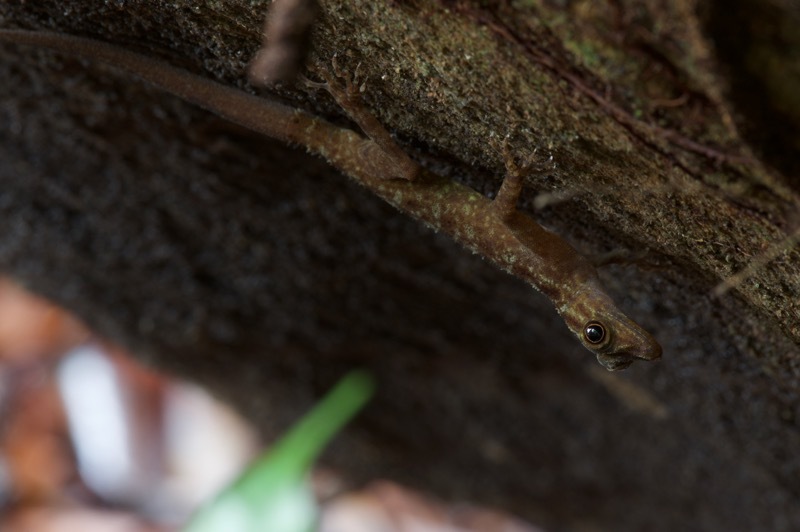 On my first visit, I was all excited to spot a smallish gecko in the shadows, clinging to the bottom of a huge boulder. I recognized it as a Cnemaspis, a genus I had not previously encountered at that time. 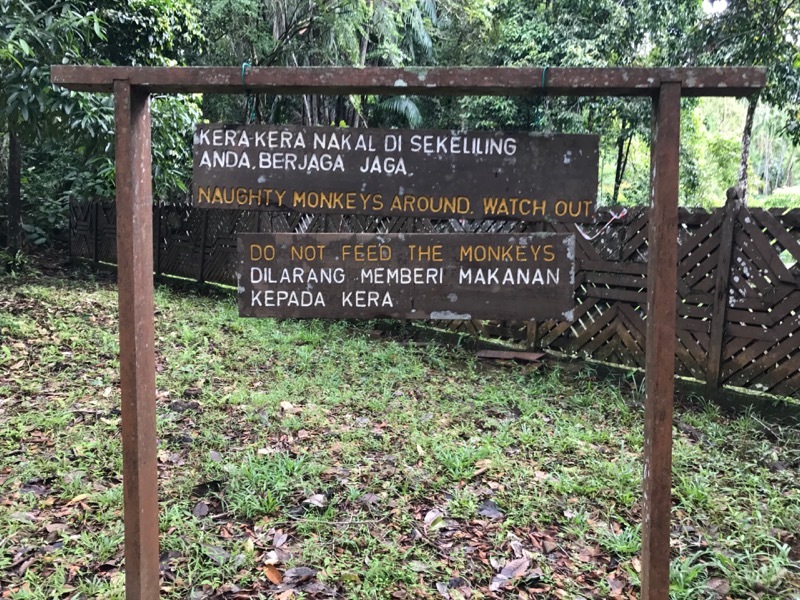 However, as you know if you've read my accounts of Kubah and Santubong, I was later to discover that these are very common in the general Kuching area at night, making this one less interesting in hindsight. Both days that I visited turned out to be overcast and drippy, which no doubt suppressed the daytime lizard activity. For example, I was hoping to see some flying lizards in the trees of the open areas, but no lizards flew or even thought about flying in my presence. On a couple of Bako's beaches, however, I did find another lizard with an interesting lifestyle. 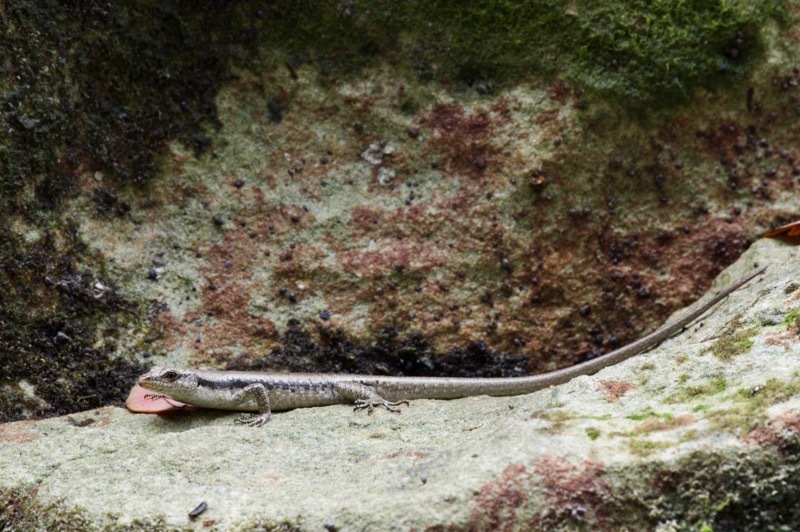 At low tide Mangrove Skinks venture into the intertidal zone, and sometimes even into tide pools, to eat insects and crustaceans. I ran across several of them, but most of them I noticed only as they dashed off into vegetation. This individual held its pose on a wet slab of beach rock as I snuck closer and closer. 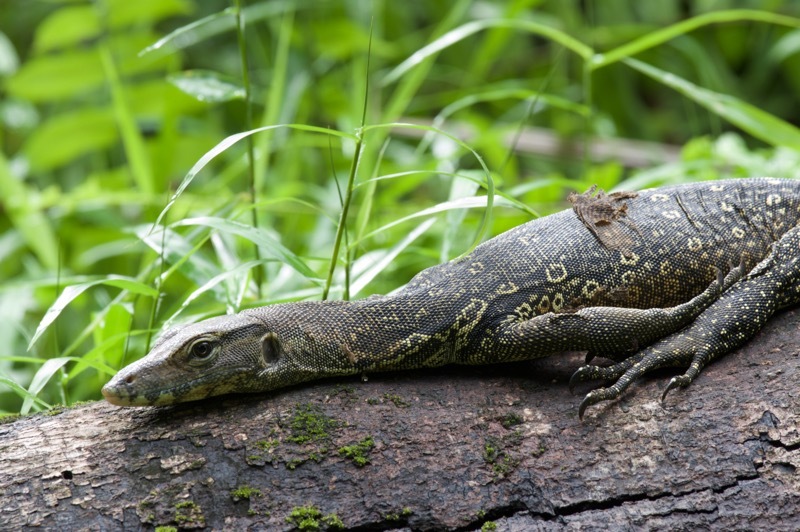 Water Monitors are plentiful throughout much of southeast Asia, but I had managed to avoid seeing any in Peninsular Malaysia. I was happy to find a few at Bako. This mid-sized monitor lounged picturesquely on a downed log near the headquarter buildings. Monkeys are the main attraction at Bako. 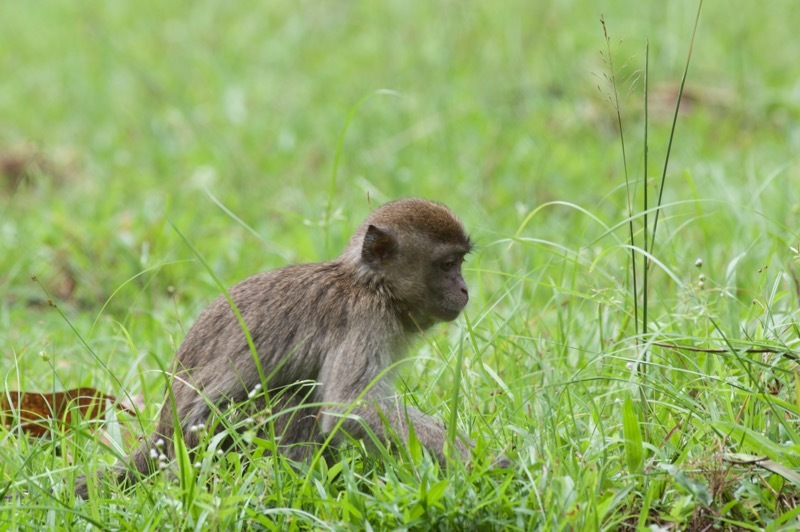 Three types of monkeys occur there, all of which are generally easy to observe. 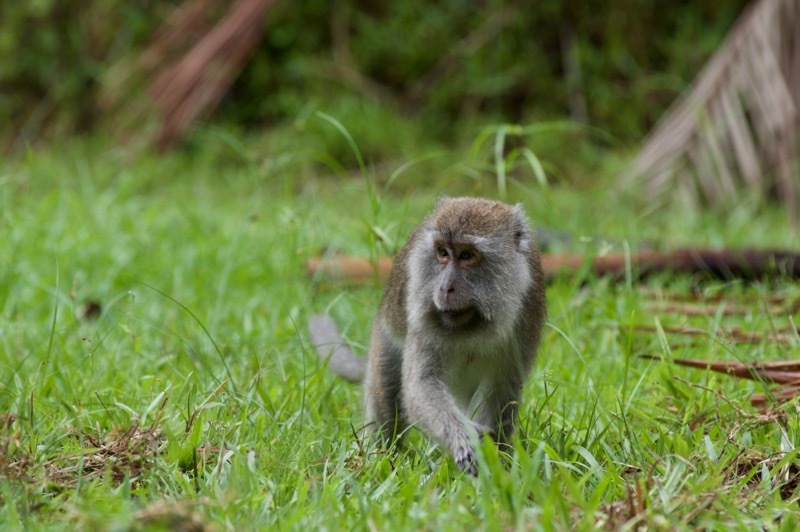 The widespread and widely disliked Long-tailed Macaques meander the grounds, looking for trouble. 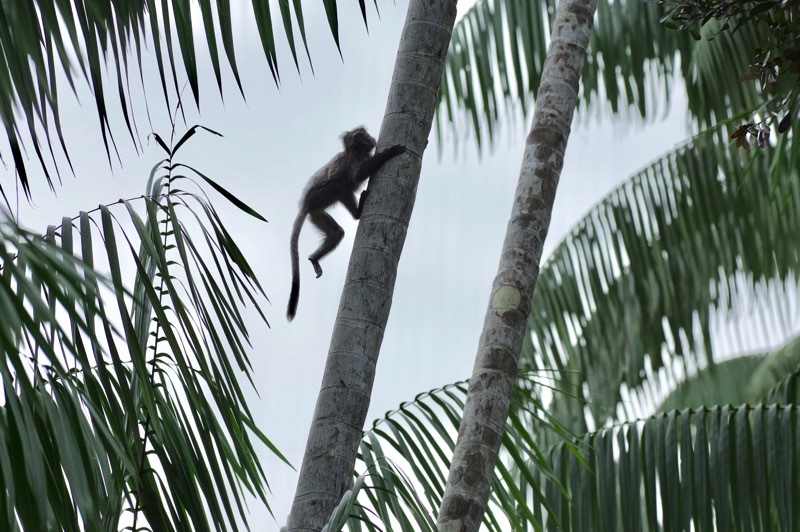 Cute little Silvered Langurs aka Silver Leaf Monkeys frolic elegantly high in the trees. 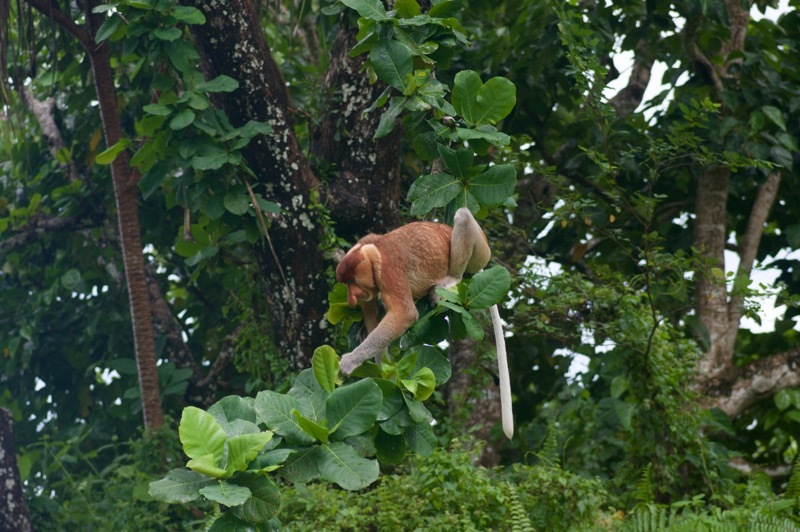 Last but most, everyone's favorite giant-schnozzed primates, the Proboscis Monkeys, draw crowds of visitors wherever they stop to chow down on leaves, seeds, and unripe fruit. On my second visit to Bako, I decided to hike the Lintang trail, which "passes through nearly all of the vegetation types found at Bako". Many visitors to Bako hike in small guided groups, but I figured I was more likely to find herps on my own, and that way I could control my own pace also. I didn't need any steenkin' guide. What could go wrong? I saw many pitcher plants on the Lintang trail and each one made me dutifully think of Hans. (But did I stop and take their pictures? Nah. I was still driven by the futile thought of finding some herps.) Nothing much was going on in the way of animal activity. Maybe a bird or two flew by. I took a photo of a millipede. That was about it. Much of the middle third of this trail is across bare sandstone. With the recent rains, much of this sandstone was at least somewhat wet, and in some areas the trail itself was basically a shallow stream. And man, was it slippery. I was hiking slowly and carefully, and still nearly slipped three or four times. Each time I thought "I must hike even more slowly and carefully". Probably in the middle of thinking this thought for the fourth or fifth time, as I was nearing the end of this plateau section of the trail, my foot slipped out from under me and I instinctively stretched my arms down to brace my fall. My right hand was holding a (collapsed) tripod, which took the impact on that side. My left hand was unencumbered, and so most of my weight landed on my left wrist. My wrist did not handle the impact nearly as well as my tripod did. The tripod is fine. My now dislocated and fractured wrist didn't hurt much as long as I held my arm up against my body perfectly still. So that's good. Unfortunately, I still had to hike another mile or so back to headquarters, on the still-wet and still-slippery trail. The last part of the trail also descends through the forest quite steeply in spots. So it was not actually possible to hold my arm up against my body perfectly still for much of the remaining hike. And those non-perfectly-still parts did hurt, much. When I reached the headquarters, the friendly park staff quickly constructed a makeshift splint and sling for me. Then I got to wait around for a couple of hours until the tides rose enough that a boat could actually leave. As we headed upriver back to the Bako Jetty, the captain pointed out a young crocodile on the bank. Hey, that's a species I hadn't seen on this trip! There is no way that I could even attempt to take my DSLR out of my camera bag, much less use it, but I did with considerable difficulty manage to fish my iPhone out of my pocket and take what turned out to be my final herp photo of my trip. Other than the ending, this trip was everything I had hoped it would be. I will probably be going back next year. Next time I hope there will be more flying lizards and cobras, and fewer trip-truncating injuries. Aaaaaargh, what a way to end such a great trip. I hope you haven't had too much of a problem with the wrist mending since your return. This just confirms my suspicions that Bako is a cursed place. Hot as hell and all the plants covered in spikes. Tiny, devil monkeys waiting to rob you at every turn and boatmen that laughingly expect you to wade ashore in crocodile infested waters! At least you now have a great excuse to return and mop up Danum Valley and Mulu. I have really enjoyed reading your series of posts from S.E.Asia. It's a shame our paths didn't cross on a trail somewhere, it would have been a refreshing change to have met someone else out looking for reptiles and amphibians. Thanks Ray. My wrist has healed well (though not quite perfectly, yet). The U.S. doctor who did the followup stuff said that the Malaysian doctor had done a fine job. I don't think I'll be revisiting Bako when I return to the area. Perhaps we shall meet somewhere in the world on some future adventure! It must have been horrible to cut short your half-around-the-world trip onaccounta measly slip on a wet stone. 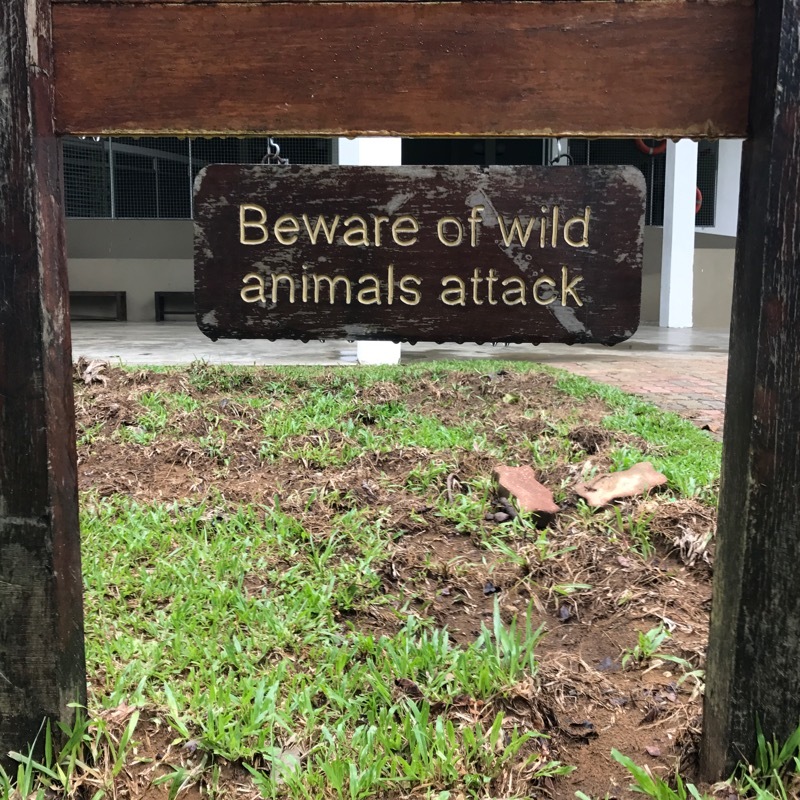 I can't begin to imagine your frustration sitting in that Kuching hotel with a cast on your wrist, with all those awesome herps beckoning just fifteen miles away. That's funny about the crocodile. 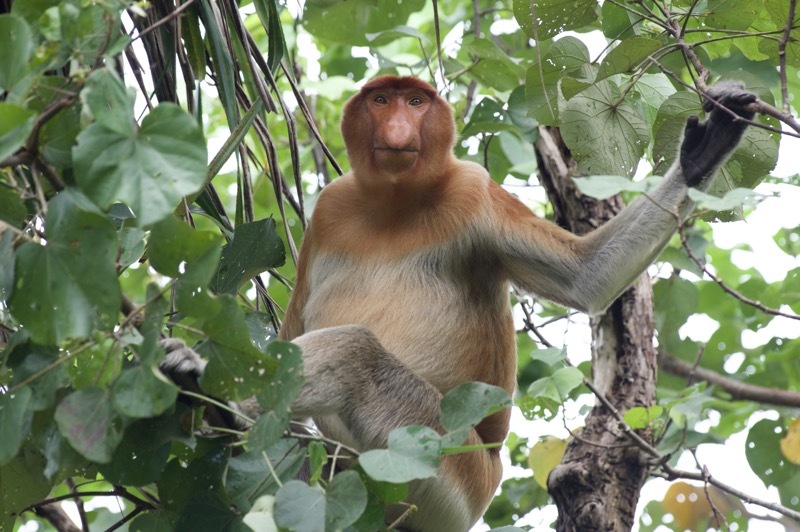 I had the impression that they were seen commonly not only along that river, but also in the mangroves around Santubong. It would have been more exciting if I hadn't seen them much closer in Australia, but I was still glad to see one. And I wasn't particularly close to the end of the Lintang trail, though I was close to the end of the exposed sandstone part. But it definitely could have been worse! 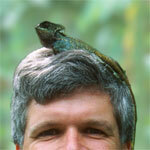 I hope we can get together when I next visit so I can show you some of the many lizards to be found near Kuching! That is really bad luck. But I agree with Hans: the crocodyle is wonderful. I have seen only one head for a few seconds in Santubong. And nice to see Bako again. Form my last visit to Bako, I remember mainly that I noticed that some kind of animal was making tunnels beneath my skin. That was a bit unnerving. In Kuching hospital, it turned out to be a worm which had entered my leg though a hole made by a leech. I love Borneo. Thanks for the great reports from some of my favorite parts of the world. I have been 3 times on the santubong river and seen around 8crocs. the morning cruise was the most succesfull. Went one time with a local fisherman who seemed to know the Region, and we found tracks of some huge crocodiles but couldnt get to see them bc they where a few m up in the bush. Will fly back next week for an other Borneo adventure. dendrelaphis wrote: I remember mainly that I noticed that some kind of animal was making tunnels beneath my skin. That was a bit unnerving. In Kuching hospital, it turned out to be a worm which had entered my leg though a hole made by a leech. I love Borneo. The leech bite actually ocurred near Kapit, the worm probably entered in Mulu while walking with sandals through the mud of a river bank catching a Boiga dendrophila. But I did not notice the worm untill we were in Bako. And I remember it so clearly because something was moving beneath my skin (very slowly though) and I had no idea what it was.... In the end, it was no big deal. But it's a nice memory. dendrelaphis, I am just a little sorry that I missed out on any subcutaneous vermiform activity, as that would at least have been fairly Borneo-specific. One can get a fractured wrist anywhere. Although I must admit that when people asked me about my cast, it was kind of fun to say "I was hiking on some slippery rocks and fell and fractured my wrist. 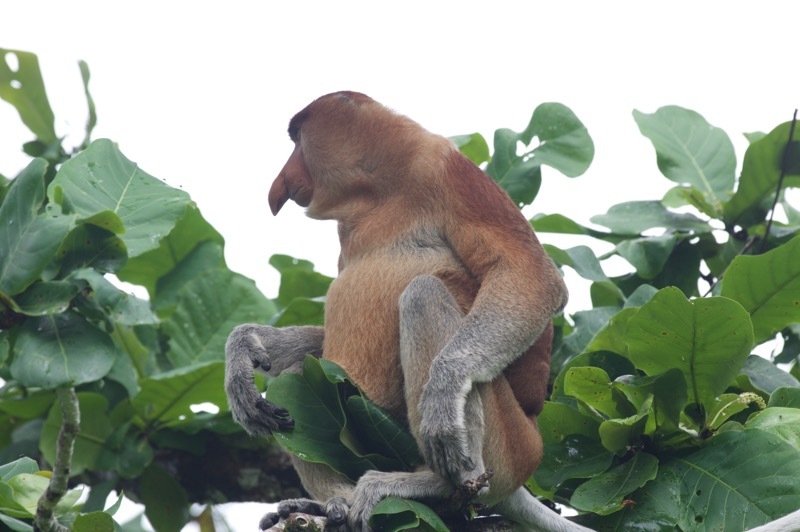 In Borneo. ", with just the right amount of pausing before the last two words. 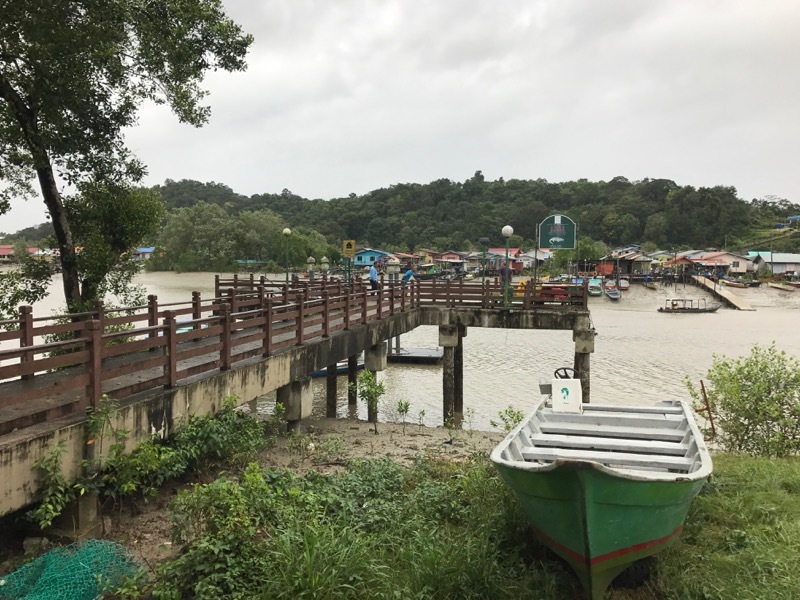 marcox, I was planning to take a wildlife cruise on the river from Permai but it turned out that the cruise wasn't offered during the monsoon season. That sounds like a good way to see crocs. Did you see any other herps from boats, like Trimeresurus purpureomaculatus? I hope you post some highlights from your upcoming trip -- have a great one! Hans, I'll make a deal with you. Despite my mild enthusiasm for body-infesting invertebrates that make for good stories, on my next trip I promise to find you some lizards you haven't seen/noticed/differentiated if you promise to monopolize the tunnelworm traffic. Deal? Ribbit wrote: Hans, I'll make a deal with you. Despite my mild enthusiasm for body-infesting invertebrates that make for good stories, on my next trip I promise to find you some lizards you haven't seen/noticed/differentiated if you promise to monopolize the tunnelworm traffic. Deal? If that means I get to keep all the varmint I can get under my skin, then deal! Thanks Ribbit. I havent seen any other herp than crocs on these. But I was with my girlfriend and she was happy to see dolphins. This time we try a another one, which combines a bit with Walking trough the bushes and spottlitting after dark. Did you see any other herps from boats, like Trimeresurus purpureomaculatus? T. purp doesn't exist in Borneo. Oops! 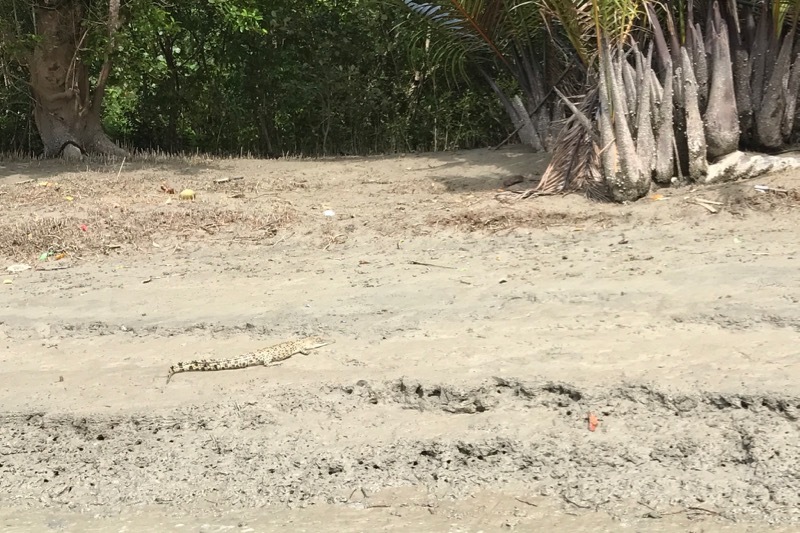 I had in my mind that there was a mangrove-dwelling viper around Santubong, but that goes to show how far you can trust my mind. Hope you have recovered from your broken arms. Btw, do u have photo of the viper in Santubong? My wrist is all better now, thanks. I have photos of vipers in Santubong in part 6: viewtopic.php?f=2&t=24340 . They are all Bornean Keeled Pit Vipers, Tropidolaemus subannulatus.